Well said and so true, as professionals who influence the lives of children, it is vital that we constantly examine our own motives and convictions. If all we did was give children what they want, our collections would be nothing but Disney princesses and Dork Diaries. If we're not encouraging children to broaden their views and take a step away from their own reality, then why are we there? Why not read a selection of those "diverse" books, identify the ones of quality and impact and then do our job--encourage children expand their world. As a school librarian, I'm ashamed to say that I only learned this year that the author of the Dork Diaries, Rachel Renee Russell, is African American. From her illustrated author image, I assumed she was white. :-/ I wish her photo were on her books. Amy, this is amazing. First of all because you chose not to identify the origins of the quotes - so often these conversations end up being finger-pointing and blaming instead of actually discussions. Second because of this "Also, I feel very strongly that if the excellent diverse books in your collection do not circulate, you are not doing your job of getting great books into the hands of readers." Just. THIS. I agree, so so whole-heartedly! Perhaps/maybe that needs to happen, so that the people who are like this can be shamed enough to face up to their racism. Well said, thank you for speaking up. I think these principles apply to adult selection as well. I am sharing this with my students (Children's library services) today. Thank you for saying what I was thinking when I read that fb thread late last night. Thanks so very much for saying what has always bothered me. Though I have always stood firm in not giving into the narrower thinkers, I often do it more privately and silently. I, too, will speak up more often to share my convictions, question those that don't align, and advocate for what all kids deserve. The Crossover is well written AND appeals to kids, since so many of my boys have read ALL of the basketball books I have! I borrow the Mitaliperkins Perkins "books as windows or mirrors" distinction, and encourage students to explore settings different from their own. They really enjoy it. I thought the Newbery list this year was the best one in a very long time! YES YES YES YES YES. Thank you for putting this so eloquently into words, Amy. This post is a must-read and echoes my very thoughts on the subject. Preach it, sister. Thank you for saying this. Well written and excellent points raised. Please continue to speak up around your colleagues, eventually they'll catch a clue. Preach it and speak truth to the awful power of ignorance. There is an ugliness that is stubbornly long-lived (been there my whole 40 year career). This is a fight that needs to be fought in years ahead. Thanks for taking up the sword and shield. "If you select materials for your readers, you are privileged to get to influence not only what children read, but what they have access to in the first place." Thank you. This is the root of the professional expectation. Bravo Amy! You can't see it but I'm giving you a standing ovation! You made so many excellent points and so eloquently. I really appreciate your thoughts. I used to work in a community much like the ones described where books with diverse characters did not in fact fly off the shelves by themselves. But I never in a million years would have thought to NOT purchase them for my collection or NOT display them or NOT booktalk them just for that reason. It was my JOB to do those things! Thank you so much for this post-I’m sure it wasn’t easy but it certainly was necessary. My first two words are: THANK YOU! But then more words beg to be written, so I'll go there. Beyond issues of race, the assumption that any adult KNOWS what is needed/wanted/of use to a child in a library is dangerous. Suddenly there are no books on domestic abuse because that isn't a problem in X community. There are no books featuring characters with alcoholic parents because it doesn't happen here. Every child needs to find him/herself in a library book; every child needs to know that he/she is not alone. And equally as important every child needs the opportunity to read about "the other" so that the other is not seen as less-than but similarities are discovered and celebrated. Thank you Amy for saying what desperately needs to be said. Every child deserves the chance to read books from all different kinds of cultures and it is our responsibility to make sure that this happens. I attended a very white school in a very white area and I read books with African American characters. I didn't care. I didn't think about it. I wanted a good story. That's what you are "selling." I have a very hard time believing children will refuse a book based on the ethnicity of the character on the cover. They may be reacting to a book that looks too historical or literary--that would have stopped me, especially certain historical books, although I owned a good biography of Harriet Tubman that I liked a lot, I was not that into history. I think this problem pertains to grown-ups, not kids. I wanted a good story. First, HOW did I miss this conversation? I'm in the group!! Thank you for this post! I know the pressure to weed books that have not/will not circulate is great but the need to expose your community to more than their small world is greater. Amy, wow, thank you for speaking out. In SF, at the Western Addition Library branch, Nancy, the children's librarian, made sure that I always found that what I needed, but that mostly I didn't even know exist. What I got from her was this realization that in those shelves existed a wold of children's literature that was extraordinary beyond my imagination, and it was multicultural, multicolored, diverse, and rich. No only Latino books for the brown girl, but books that took me to unknown cultures and communities. I felt in love with children books. I was 25. Thank you for your brave posting. Such important points here. I'm sharing with other selectors in my library, because I think this has applications all across the board. It breaks my heart to think that kids are going into these libraries, not seeing themselves represented, and getting the message that libraries are not for them. We have to do better than this. When I was hired at a school that was 80% Vietnamese, I quickly discovered that the most popular book in the library was Gone With The Wind. In Vietnamese. I asked the girls if they knew they weren't white southern belles. They assured me that they knew who they were but wanted to read it anyway. I pointed out that the "sequel" had been published and wondered how long it would take for it to be in paperback. One girl said, "Would you like me to bring you one?" She did, and donated it to the library for others to read. I started adding Woodson to the collection and they were devoured. My standard question to students was, "What did you like about the story?" They ALWAYS told me the story and the feelings they had when they read the books. They never mentioned the color of the characters. Never. Thank you for your post, Amy. At last year's Day of Dialog in NYC, Kwame Alexander spoke of the need for "diverse thinkers"--so true! To that end, we really must endeavor to celebrate, relish, and promote beautifully written narratives from diverse perspectives. Thanks so much. This is a fantastic essay. I will share it widely. Thanks for the post Amy. As a past selector for a large library system, I would hear this all the time from some librarians who were mad when I purchased books that they felt did not represent their communities--books much like Brown Girl Dreaming. If always made me feel sad and I realized that not every library was a magic place--although I had wonderful librarians at many other branches who never gave up and went against convention. As well, there is another issue not being acknowledged in our profession: anti-intellectualism. We went from collections that had no popular materials and plenty of elitism to collections averse to the literary and the intellectual and plenty of commercialism. Both times we embraced professional narratives that state we know better than individual children what they want to read or what they may find interesting and meaningful. Popular professional concerns have gone from statements like "they shouldn't read that" to "they wouldn't read that" without ever taking into consideration the possible instead of the probable and that this is a subtle form of censorship. We need to get back to that spirit of possibility every time we make a book recommendation, choose books for a website booklist, place a book on a display shelf, select a book for our collection, or pick a book for a storytime. Ranganathan stated "every reader, her/his book and every book, its reader". How we have come to let this ideal down. But then again, Ranganathan was an Indian man, so maybe he "just doesn't go" in some librarian communities. Thank you SO MUCH for this. Talk about frowny faces--I was shocked and upset that librarians--people who are in a sacred position, with a sacred responsibility not just to their community, but our entire culture and nation--were taking such an incredibly narrow-minded and frankly censorious position. Thank you for writing this! Beautifully said. As someone who is biracial (and has been mistaken for having many different types of heritage), I also cringe whenever people say "we don't have ... here." Don't be too quick to make assumptions about your patrons (or their family and friends). Besides, the beauty of books is that they are rooted in the particular but help us transcend barriers. All the recent research on fiction cultivating empathy attests to this. It's also funny how many consider race as the defining feature of some books, yet do not consider it as a factor at all when recommending, say, Jane Austen. Can you relate to an 18th century Englishwoman because she's white too, but not to a 21st century American woman because she's black? (and if it really makes us sad, it's time to sell it to a new group). 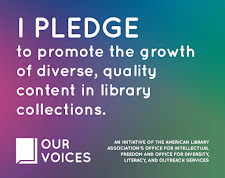 I'm hoping readers of this blog post "Selection is Privilege" will reconsider the library world's general censorship of books by or about ex-gays. I reported on Annoyed Librarian for writing about this. One librarian even said I was a homophobe for suggesting libraries stop censoring exgay books. Would you censor such books? Why? What would Judith Krug say about your motivations? The best books bring us to new ideas and perspectives and stretch our worlds and minds. I have cherished the moments spent with diverse characters in books such as" I Know Why the Caged Bird Sings", "I Am Malala", Black Elk Speaks, The Kite Runner and so many others. As a librarian, it has been such a privilege to be able to bring high quality, diverse literature to the hands of my patrons. Thank you for speaking out on this important topic, which olds true now more than ever. Thank you, thank you, thank you for this deliciously eloquent and passion-filled post. I found myself saying "amen!" all throughout my reading of it. Your words mirror my passion and mission, and I feel refueled to go out and reach as many libraries and schools as I can in my corner of the world (West Michigan) with the message of how important diversity in children's books is for ALL children! Another essential consideration in this discussion: if all of us who put books in the hands of majority children - writers, illustrators, parents, teachers, librarians - limit selections to those that look like them, we are contributing to the development of their unconscious bias. For their humanity, white children need images and narratives that challenge the centrality of the majority and introduce them to the rest of their family. Thank you so much for taking the time to put into words what many of us feel in our libraries. Books are both windows and mirrors, and kids (and adults) need both. I love this "cheat sheet" that Grace Lin developed: http://www.gracelin.com/media/press/diversitycheatsheet.pdf where she emphasizes selling the story, not the ethnicity of the characters. I also think it's vital that kids see us, as librarians and teachers, reading diverse books. Putting up a "What is Mr./Ms. ______ reading?" sign always gets kids interested in what I'm reading. I also think we as school librarians need to be conscious of "hand-selling" diverse books to teachers who are looking for read-alouds and links to lessons. Amy, I appreciate your position, and couldn't agree more that as Librarians we can help generate the enthusiasm in a young reader to overcome any biases that will keep them from opening a good book, and having the world open to them. It is one of the coolest parts of what we do. You have touched on an interesting point of tension--or, rather, it could be tension, or it could be a pursuit of balance in a collection. I would hold that both points are true, as you said: that collections should reflect their communities and also not be limited to their communities. I think this is possible, in theory, because we are talking about collections of hundred or thousands of items; we can find balance in having both statements accurately describe a collection. The deeper, more systemic issues, at least as I see them (and I very certainly may be wrong or ignorant of something), are that there is a gross imbalance in the materials that are published in any given year--that is, the body of published work skews white/heteronormative. This imbalance in supply impacts what we can add to our collections in our pursuit of a "balanced" collection. So we're trying to make balanced collections from imbalanced options. Also, as with many topics in our professional and cultural discourse, the issue is often boiled down to an either/or: either we reflect our community, or we collect beyond our community. That's a false dichotomy--we can, and should, do both. In particular, we should be mindful that this false dichotomy can be used to justify biases against collecting certain materials, against publishing certain books, etc. But if we can see the shelves we fill, the need for stories, as capacious, such prejudiced arguments--ones that reinforce systemic inequality--cease to be valid. It's March and your post is still getting around. This is a very important delivery and I am relieved to hear compassion in your voice. I hope that this message continues to build momentum. The librarian profession has been looking like an all white social club and it is really more than that. Thank you for expressing some ethical issues that need to be brought to light. It is difficult to move from good to better, but you just did. Thank you. Just reading now. I am an English teacher at a small school for gifted kids in L.A. Thank you! Come work at Skokie Public Library!